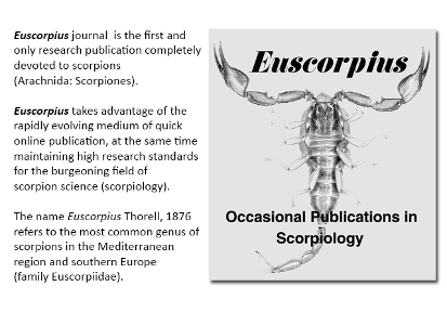 “Euscorpius” archive (issues 1 to 270) is also available at the journal's old website. Teruel, R., Kovařík, F., & Fet, V. 2018 . Revision of the Central Asian Scorpion Genus Anomalobuthus Kraepelin, 1900, with Descriptions of Three New Species and a Generic Synonymy (Scorpiones: Buthidae). Euscorpius, No. 270: 1-45. Kovařík, F. 2018 . Notes on the Genera Buthacus, Compsobuthus, and Lanzatus with Several Synonymies and Corrections of Published Characters (Scorpiones: Buthidae). Euscorpius, No. 269: 1-12. Kovařík, F., Lowe, G., & Šťáhlavský, F. 2018 . Three New Chaerilus from Malaysia (Tioman Island) and Thailand (Scorpiones: Chaerilidae), with a Review of C. cimrmani, C. sejnai, and C. tichyi. Euscorpius, No. 268: 1-27. Kovařík, F. 2018 . A new scorpion species from Kenya, Gint childsi sp. n. (Scorpiones: Buthidae). Euscorpius, No. 266: 1-9. Kovařík, F., Aydin Yağmur, E., & Moradi, M. 2018 . Two new Hottentotta species from Iran, with a review of Hottentotta saulcyi (Scorpiones: Buthidae). Euscorpius, No. 265: 1-14.
de Armas, L. F. 2018 . A new species of Microtityus from the British Virgin Islands, West Indies, and new localities for other scorpions (Scorpiones: Buthidae, Scorpionidae). Euscorpius, No. 264: 1-10. Lowe, G., Kovařík, F., Stockmann, M., & Šťáhlavský, F. 2018 . Review of Microbuthus with description of M. satyrus sp. n. (Scorpiones, Buthidae) from Oman and Yemen. Euscorpius, No. 263: 1-22. Ayrey, R. F. 2018 . A New Species of Vaejovis from the Patagonia Mountains, Southern Arizona (Scorpiones: Vaejovidae). Euscorpius, No. 262: 1-12. Lowe, G. 2018 . The genera Butheolus Simon, 1882 and Xenobuthus gen. nov. (Scorpiones: Buthidae) in Oman. Euscorpius, No. 261: 1-73. Kovařík, F. 2018 . Scorpions of the Horn of Africa (Arachnida, Scorpiones). Part XVI. Compsobuthus maidensis sp. n. (Buthidae) from Somaliland. Euscorpius, No. 260: 1-11. Kovařík, F., Lowe, G., Just, P., Ibrahim Awale, A., Sh Abdirahman Elmi, H., & Šťáhlavský, F. 2018 . Scorpions of the Horn of Africa (Arachnida: Scorpiones). Part XV. Review of the genus Gint Kovařík et al., 2013, with description of three new species from Somaliland (Scorpiones, Buthidae). Euscorpius, No. 259: 1-41. Kovařík, F., Ranawana, K. B., Jayarathne, V. S., Karunarathna, S., & Ullrich, A. 2018 . Scorpions of Sri Lanka (Arachnida, Scorpiones). Part II. Family Hormuridae. Euscorpius, No. 258: 1-5. Teruel, R., & de los Santos, G. 2018 . Two new Tityus C. L. Koch, 1836 (Scorpiones: Buthidae) from Hispaniola, Greater Antilles. Euscorpius, No. 257: 1-16. Kovařík, F. 2018 . Scorpions of the Horn of Africa (Arachnida, Scorpiones). Part XIV. Hottentotta somalicus sp. n. (Buthidae) from Somalia. Euscorpius, No. 256: 1-8. Fet, V., Kovařík, F., Gantenbein, B., Kaiser, R. C., Stewart, A. K., & Graham, M. R. 2018 . Revision of the Mesobuthus caucasicus complex from Central Asia, with descriptions of six new species (Scorpiones: Buthidae). Euscorpius, No. 255: 1-77.